While we're all familiar with the major fashion communities of the world, Australians are catching up to the fashionable set with a covetable style all their own. I can't seem to get enough of their cool styles, footwear and accessories. 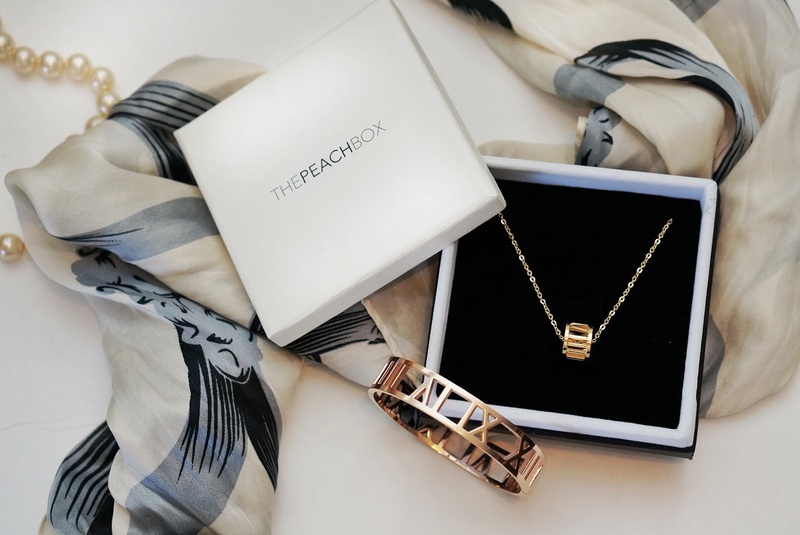 One awesome brand I'm currently loving is The Peachbox, a super chic jewelry e-retailer that is turning out delicate designs that make a sleek statement on their own or layered with your favorites. Whether its their classic bangles in luxe golds or silver tones or timeless pearl earrings, keeping things simple and effortless is the art to The Peachbox. Catering to both the girl who appreciates a clean, sleek look as well as those who love a little bit of glitz and sparkle, The Peachbox is a perfect place to score beautifully made jewelry with wallet-friendly price tags. 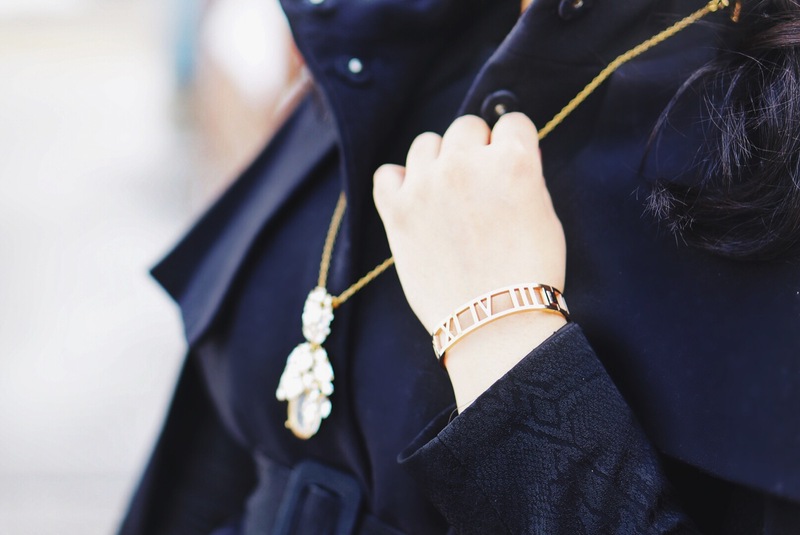 Having been a long time fan of roman numeral style jewelry, I instantly gravitated towards their best selling Roman Empress bangle and charm necklace. 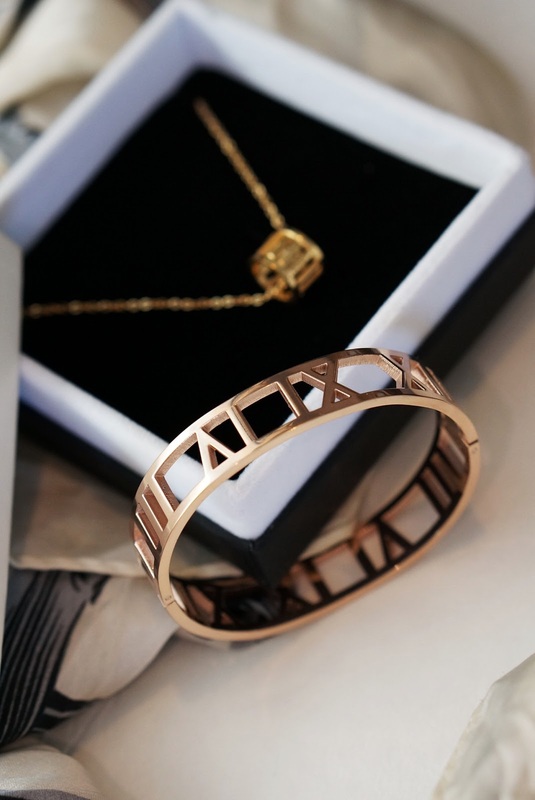 While gold is always my go-to option, I couldn't say to no to the bangle in their beautifully blushy rose gold tone. Upon opening both pieces, I was blown away from by their quality. For such a low price point, each piece was well made, of a nice weight, and shined in luxe way. Most wallet-friendly jewelry tends to give off that gaudy, cheapy sheen but that was absent in these pieces. You would never guess they were under $40 a piece. In addition to jewelry, The Peachbox have added Marc Bale timepieces to their collection of already top selling products and naturally, all watch designs follow their classic, timeless aesthetic. It's safe to say that I will be adding to my TPB pieces in the near future. If you'd like an idea of how their pieces look on actual shoppers, head over to their equally chic instagram page where they feature shoppers' beautiful snaps and give a real look at how their jewelry wears. Additionally, the brand announces promotions and fun sales on twitter, snagging jewels for well under retail is always a winning option.